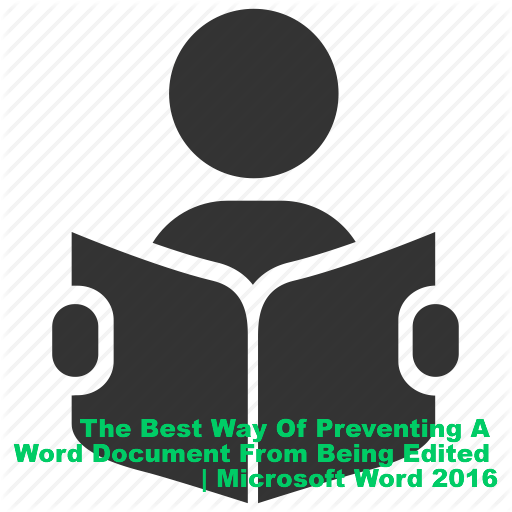 If you do not want someone reading or viewing an e-document you prepared using Microsoft Word 2016 not to be able to edit the content of the document, then your best option is to activate the Editing restriction functionality before you save the document the last time. To do this, follow the steps below. In the Protect command group of the Review tab, select Restrict Editing. When you do, the Restrict Editing task panel will be displayed at the right side of the text area section. Check the two box in the Formatting restrictions and Editing restrictions section in the task panel. 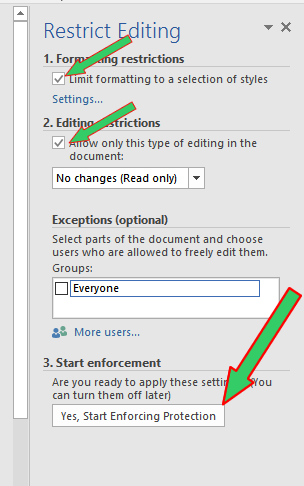 Next, click on the Yes, Start Enforcing Protection button in the third section of the Restrict Editing task panel. Once you click the button, a Start Enforcing Protection dialog box will pop-up. Check the radio button titled Password and enter a password of your choice in the Enter new password (optional): text field. Re-enter the same password in the Reenter password to confirm: field, and the click the OK button. Note: Entering a password is not a requirement but an optional choice. So if you do not which to put a password just leave it blank. But we recommend that you put a password, because doing so will ensure that only you or those you have told the password can be able to deactivate the Editing Restriction you have placed on the document.